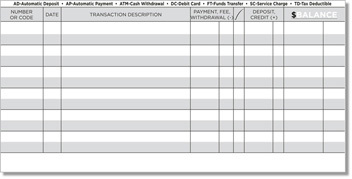 Using personal checks is one way to keep a close eye on your finances. 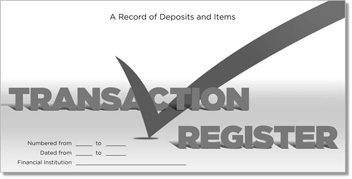 Using a transaction register from CheckAdvantage makes it easy! Track your payments, withdrawals and deposits so you always know your balance and exactly what's happening with your checking account. The register has 30 pages with a total of 195 double-spaced lines. 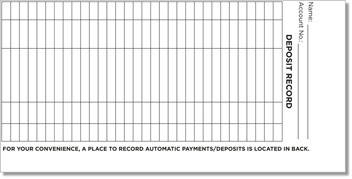 It also includes calendar and notes pages along with an automatic deposit/payment reminder page. 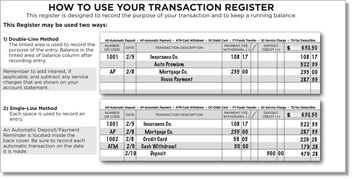 CheckAdvantage Transaction Registers are available to order with your new personal checks for just $1.95 each. That's a very small price to pay for a little extra peace of mind. 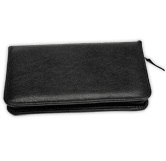 Note: You'll receive one free register with each personal check order from CheckAdvantage. Get more today to make sure you're on top of your personal finances!